It's a big question for school librarians. How invested do I want to get in a series? If Sands' The Blackthorn Key runs to nine books that are all four inches wide, do I want to persist past book three? How bad a librarian am I if I don't? 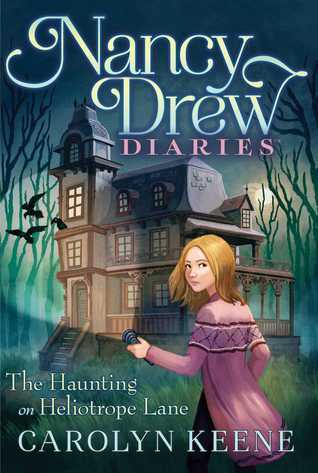 Then again, The Nancy Drew Diaries are really popular, so I have 16. But what happens when they are no longer popular? That's a lot of shelf space. Coco Simon's The Cupcake Diaries at thirty books? Nope. Got to 20 and called it a day. Even the public library only has e books for the others. Don't get me started on Somper's Vampirates. Seven books, and the first is completely in tatters. Only two people have ever read the last two. Argh! I keep reminding myself that publishing is, in fact, all about making money, and NOT about making school librarians happy. If this is the case, do series that go on interminably really make money? I'm not seeing it. If an author does well, I would (were I a publisher) have them write different series of maybe five books each. Like Rick Riordan. The first book in a series HAS to sell better, since I will frequently purchase two of a popular series, to insure that I have a copy when one falls apart. Might have had to arm wrestle a sixth grade girl for this one. Well, actually, there was a Scholastic WISH book that she wanted that I also needed to read, so we each took one and plan to trade! Nancy and her friends have heard rumors that the house on Heliotrope Lane is haunted by the ghost of Mrs. Furstenberg, who died of a heart attack... but was it caused by her son, with whom she had a contentious relationship and who is now missing? Local children have been breaking into the house and trashing it, and a girl named Willa and her brother Owen approach Nancy about a friend who visited the house and is now volatile and odd. Nancy and her friends visit the house even though it is wrong to do so, and end up getting taken to the police station, although their parents are even tempered about it. There's something going on, but it takes Nancy a while to track down the forces behind the "haunting" and make things right. Strengths: Like the Phoebe Rivers' SaraNormal series, there is something wickedly addictive about these, more so than any other Drew series I have! I keep saying I won't buy anymore, but then a reader comes and asks for the next one because the public library doesn't have them in anything but e book form, and I break down and buy it! On the up side, these don't need to be read in order, and they are a great length for a mystery. This volume was one of the best-- nicely creepy! Weaknesses: Mrs. Furstenberg's house is very clearly described as a "small ranch-style home" with light blue shingles that "had probably been a cute little house". What is this on the cover? What I really think: Love. Slow but steady circulator. Money well spent. Students read. That's what we want in middle grade books, isn't it? Tamiko enjoys going to her friend Allie's mother's ice cream shop to work every Sunday. It's the only chance she gets to hang out with Allie and with their friend Sierra. It's fun to work in the shop, too, making ice cream sundaes and dealing with customers. However, soon things are not always fantastic on Sunday. Tamiko has great ideas for things like unicorn sundaes, but Allie gets in a snit about spills, wasted ice cream, and being nice to customers. Tamiko isn't worried about these things until she starts to understand the realities of owning a business with a very small profit margin. She tries to keep waste to a minimum, but she also doesn't care to be talked to by Allie's mom when she is late or has a problem with customers. She is busy with other things, so she considers stopping her work at the shop. Hint: There are at least four more books planned for this series, so I don't think that will happen! Strengths: I love these because they are just well done and easy to read. Tamiko's concerns are realistic, as are her reactions. (What tween really understand sprinkle wastage?) 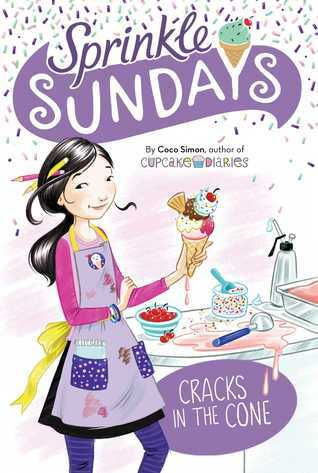 Books where Children Do Things are always fun and empowering, and if they involve unicorn ice cream sundaes, all the better. The parts about dealing with difficult customers would have been useful to me when I worked in two stores in the mall in high school! Weaknesses: I really hope this stops at ten books or less. What I really think: Had a 6th grader waiting for this while I had it home to read! The covers are bright and happy and help a lot! I have nothing to say except AUUUGHHHH. And also, when you have volumes 1-10 of a series and the most high-circing ones are 2, 5, and 7 and the others haven't checked out in five years again AUUGHHHH.